Lidia Tomulet has been a writer since 2008, covering subjects related to natural children's health, homeopathy, nutrition and lifestyle. She contributes her expertise in the areas of alternative and holistic medicine to various websites. Tomulet holds a Bachelor of Arts in psychology from Southern Methodist University and a naturopathic doctorate from the National College of Natural Medicine in Portland, Ore. 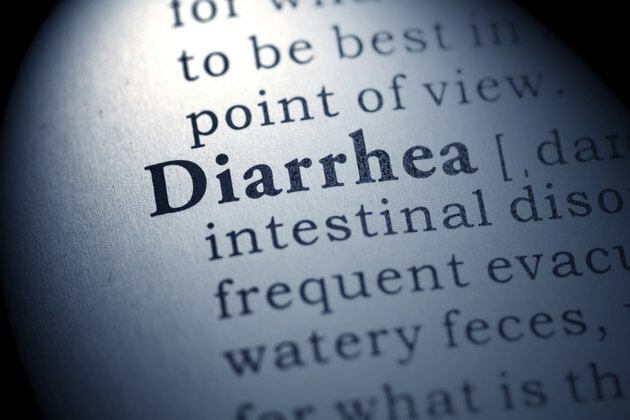 Most people have experienced diarrhea at some point in life, and while it is uncomfortable, it tends to resolve on its own within a few days. Acute bleeding diarrhea, however, can be a sign of serious illness and should be treated as a medical emergency, according to the May 2009 issue of the medical journal "Gastroenterology." Rectal bleeding is usually a sign that there is something wrong, and it is important to work with your doctor to identify the cause so appropriate treatment can be prescribed. Gastroenteritis is the term used to describe an inflammation of the stomach or intestines caused by a virus, bacteria or parasites from contaminated food or water, food allergy or reaction to certain medications. According to The Merck Manual, most cases of gastroenteritis are infectious. Bleeding diarrhea is a symptom most common in infectious gastroenteritis caused by a subtype of E. coli, but it can also be seen in infections with Salmonella and Campylobacter. Consumption of undercooked poultry or beef, unpasteurized milk or juice, and eggs can increase the risk for gastroenteritis. It is important to consult a doctor so appropriate diagnosis and treatment can be achieved. Inflammatory bowel disease, or IBD, refers to a group of inflammatory conditions of the bowel. The most common of these are ulcerative colitis and Crohns's disease. Ulcerative colitis is described as a non-specific inflammatory response that is limited to the mucosa and submucosa of the colon, not usually causing perforation of the colon. Crohn's disease is a granulomatous inflammatory reaction that involves the entire thickness of the bowel wall. Bloody diarrhea is more common in ulcerative colitis, but can also be a symptom of Crohn's disease. Correct diagnosis requires imaging and physical exam by a doctor. Less common but possibly more serious, rectal bleeding can indicate the presence of polyps or colon cancer. Polyps are masses that arise from the lining of the colon and can in time become cancerous. Colon cancer is typically found in people older than 40, and many have at lest one other relative with colon cancer. According to the Mayo Clinic, a diet of low fiber and high animal protein increases the risk for colon cancer. A recent change in bowel habits should be reported to a doctor, especially if blood is present in the stool. According to the Mayo clinic, when someone older than 60 experiences bloody diarrhea, there is a good chance they are having an episode of ischemic colitis. Ischemic colitis occurs when blood flow to a particular section of the colon is restricted or blocked. Lack of blood to a tissue leads to lack of oxygen and possible damage and even death of that tissue. When tissues are damaged they can start to leak blood. Predisposing factors include dehydration, congestive heart failure, infections and recent surgery. While some cases may require hospitalization for rehydration, most ischemic colitis episodes resolve on their own and do not typically recur. What Causes Blood Clots in Stools?